Structural Bolts or "TC" Tension Control Bolts follow ASTM A325 and ASTM A490 specifications. 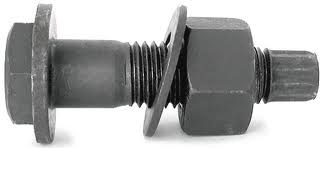 They are a three piece fastening system consisting of: 1) a round-head bolt with a truncated, flat surface area at the top, and a 24-sided tip which protrudes from the opposite end. The tip is calibrated to shear off when the proper tension is achieved; 2) a 2H heavy hex nut, and 3) a structural washer.